This was a major project taking about four months from mid 2013 to end February 2014. 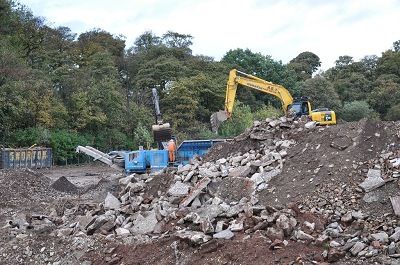 It was carried out by specialist demolition contractors, ADM Regeneration. Much of the Kay Metzeler factory has been reduced to ground level. The office building has gone (it was on the extreme right of the picture). 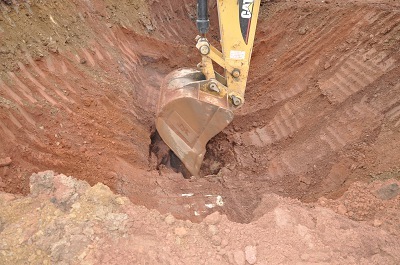 A culvert was found under the centre of the site. It was not obvious what this had been built for, but looking at its shape, and the fact that it still had water in it, we concluded that it might have been a stream running across the site to join the river at the far end. Where you see water the stone culvert has already been removed. 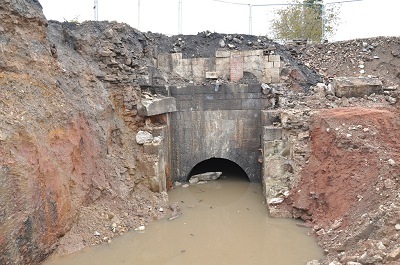 The remaining culvert, showing how deep it is below ground – about 4m. Everything manmade had to be excavated and replaced by fill. Mountains of stone and concrete were moved around the site to be crushed and used as back fill. Hundreds of tons of steel was cut up and sent for re-cycling. There was almost no pollution found on the site. The small amount found was carefully removed and disposed of elsewhere. Diggers and dumpers! 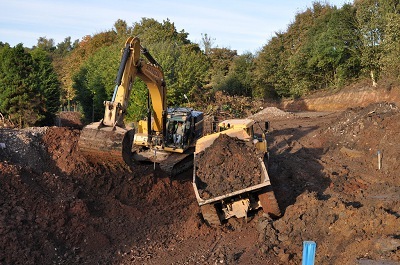 A whole variety of diggers and dumpers spent months moving the material on the site to get at all the underground parts that had to be dug out and then to relocate material so that the right kind of soil was buried or on the surface as required – and, of course, all to the right levels. Great trouble was taken to ensure that the ground that would be under a building was all built up in the same material, in order to avoid any differential subsidence. 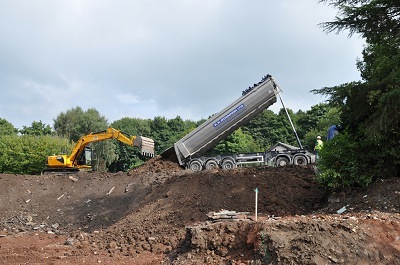 Hundreds of truck loads of soil where brought to the site to raise the ground level in order to prevent flooding of the new estate – only time will tell if this was adequate! The soil came from Ringway Road, Manchester, where there were major excavations for the new tram line to Manchester airport. 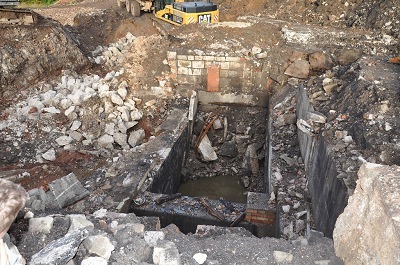 There were plenty of subterranean remains of the original Waterhouse mill. All had to be discovered and removed. The water wheel pit was constructed in the early days of the original cotton mill. It was part of the big mill building which probably dated from the second incarnation of Waterhouse mill built in 1800 – after a fire destroyed the 1789 mill. The pit was re-discovered almost by accident! We knew roughly where it would have been but expected it to have been filled in. However, it turned out to be un-filled and covered over by a very flimsy construction of odd steel joists and not very thick informally reinforced concrete. The demolition machinery and the 40 ton tipper trucks had been driving over it for weeks! How it continued to support them we will never know! 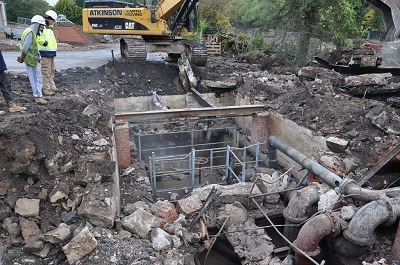 Once the top was removed we could see that the pit had been re-used once the mill had changed over from water power to steam power. 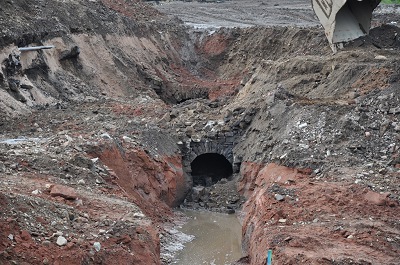 A dam had been built across the pit and a large number of pipes and valves installed. All of this metalwork had been buried for more than 50 years, since the wheel house was demolished in 1962, and yet it was in extremely good condition with very little rust. 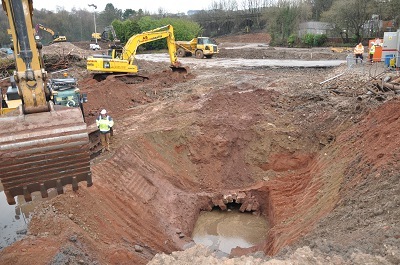 The pit was full of water which could be drained by opening the valve. After all this time the screw valve worked perfectly and without any difficulty! 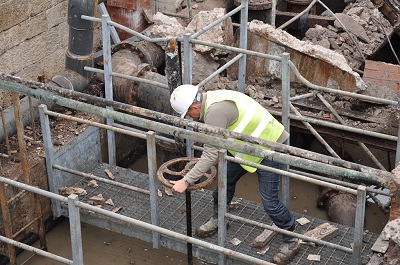 Once all the metal had been removed it was possible to see the wheel pit more clearly. It was about 24ft long by just under 10ft wide. So the original water wheel would have been a similar size, c.24ft diameter x 9ft 6in wide. The top half (the above ground part) had long gone, so we are looking at the bottom, a bit less than half the original chamber. The wheel shaft would have been mounted a few feet above the remaining walls. The wall across the pit at the bottom of the picture was modern concrete and not part of the original structure. 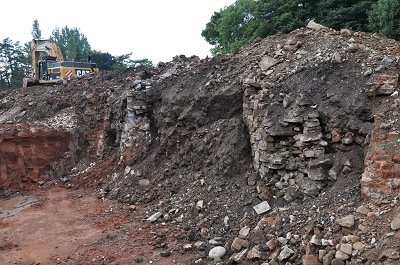 The near end of the pit is immediately below the nearest bit of rubble and is a vertical wall. The far end is a radiused wall which is almost vertical at the top and declines to horizontal at the bottom. The wheel would have fitted closely within the pit and against this radius in order to keep as much as possible of the water on the wheel paddles for the full drop to obtain the maximum energy from the water. The feed to the wheel originated in the Recreation Ground – the weir was put there to feed water into a leat (now visible but blocked off) which passed through a culvert beside the cottage (it used to leak into the cellar), across the road and opened into the ditch still visible between the river and the industrial buildings. This went through a viaduct arch and along the other side to a small mill pond approximately where the electricity substation is today. The water was then fed to the top of the wheel, probably via a siphon, but we have no certain evidence of this. 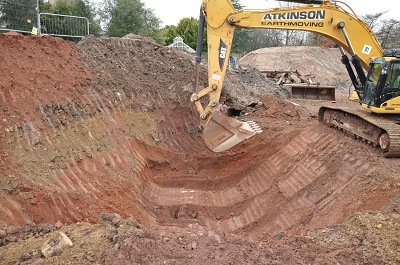 Once the pit had been excavated it was possible to see the exit culvert at the bottom end of the pit. The wheel would have been located immediately in front of the camera and would have been turning towards the camera. 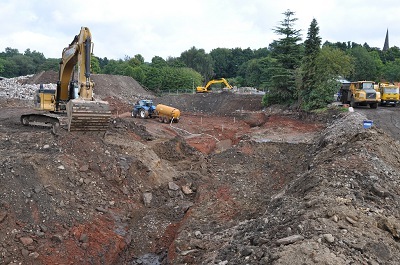 When the water reached the bottom of the pit it would race away down the culvert to the river at the far end of the site – actually close to Garden Street bridge. All of the stonework was notable for its great quality of both stone and workmanship – after more than 200 years it remained in really excellent condition! 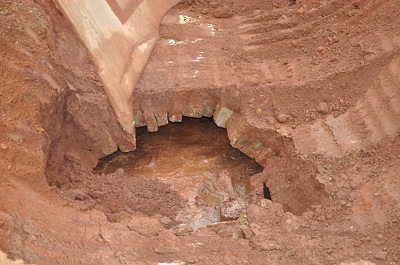 The culvert required occasional inspection and repair. It was about 6ft wide and 4ft 6 inches high, more than 200m in length, an arched structure built out of stone, no mortar, and with a stone invert (floor). The last person known to have undertaken this very unpleasant task was the late Bryan Holmes, left. 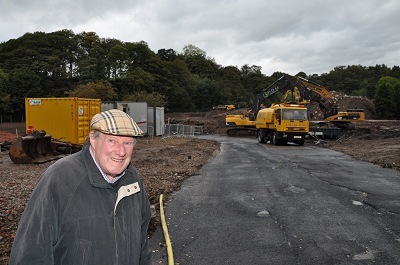 He worked at Waterhouse mill after WWII and, as a young and fit lad, got all the nasty jobs to do! He crawled through the culvert inspecting the arch above him, never able to stand up straight, often having to lie on his back in the water, dragging his lamp and his tools with him, re-fitting any stones that had fallen out of place! And when he got as far as he could go – when the water got too deep – he could turn and crawl all the way back! 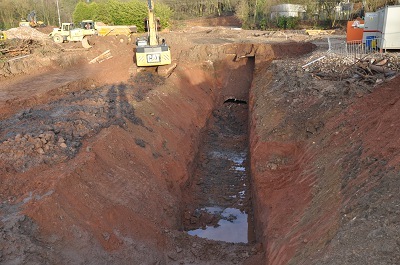 This long culvert had now to be dug out. The stones visible in the bottom of the trench are the top of the stonework. 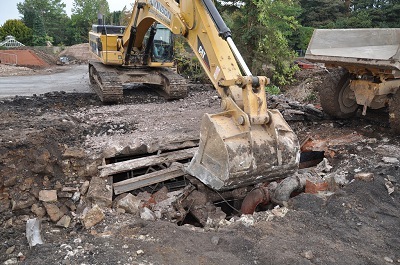 Time to break through – it was so strong that the tracks of the digger were lifted off the ground before the culvert collapsed! It was almost full of sandy water. 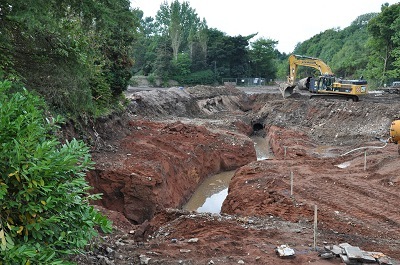 Now see how big the culvert was! Compare it to the site manager standing by the digger. Once the stone culvert had been removed it was possible to see that it had been built within a trench carved out of the solid sandstone rock! Remember that must have been dug 4m down and cut out of the solid rock entirely by hand! No huge hydraulic diggers in 1800! 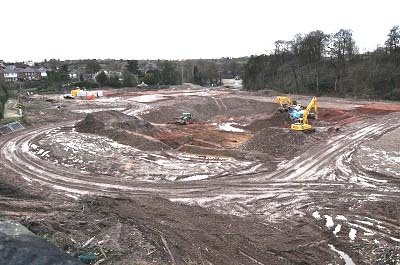 Before the demolition work began the site was surveyed by geologists to ascertain its suitability for re-development. Their drawing shows a line across the site at this point – marked as a previously unknown earthquake fissure! By February 2014 most of the material was in its final position. The future roads were becoming obvious in the mud, top soil was being spread where gardens would one day flourish. 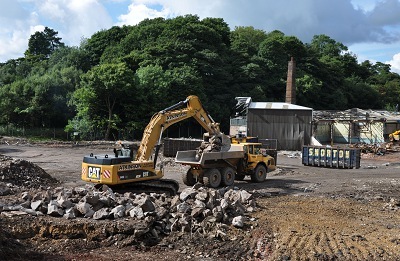 In March 2014 the road builders and drain layers had moved in and construction work began to take over from demolition. 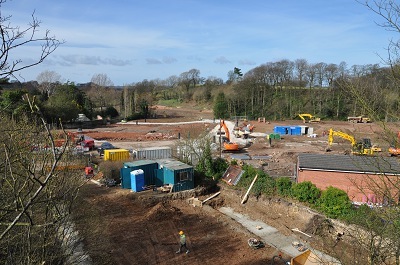 In the lower part of the picture the foundations for the new Co-op store have been laid and construction of the building is about to begin.